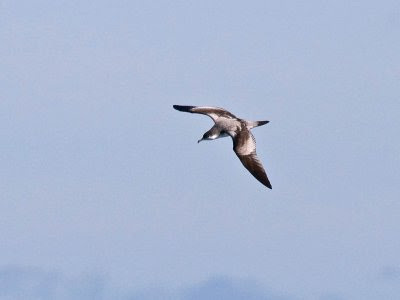 What kind of sea birds will you enjoy on your Oregon ocean bird watching tours? Here are five common Oregon sea birds that you can expect to see on your pelagic birding boat trip. Black-footed Albatrosses are crowd-pleasers. They soar in on 6-7 foot wing spans and land next to the boat to seek food scraps. They are seen nearly every trip offshore at least 20 miles and are common from March through October. Buller's Shearwaters are one of the most beautifully-patterned seabirds. Gliding gracefully over the sea alone, or flapping in amazing synchronized flight in a flock, these are a delight to see. They are only found in the autumn, however, from late August into October. 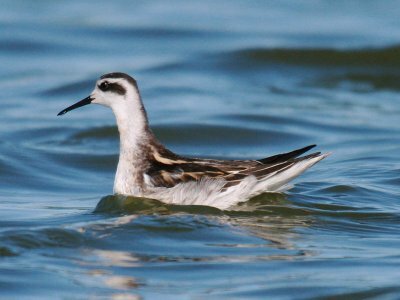 Red-necked Phalaropes are tiny little shorebirds that swim in the ocean! Each spring and fall huge numbers migrate on nearshore waters back and forth from the Arctic tundra, generally within 15 miles of shore. You may see these occasionally on bays and inland ponds, too. Sabine's Gulls in breeding plumage with black hoods are a joy to see in spring, primarily more than 15 miles offshore. The wing is highly patterned on juveniles coming back from the Arctic in fall. 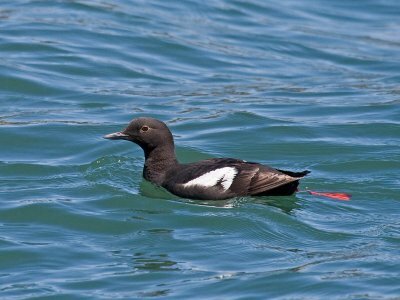 Pigeon Guillemots are nearshore birds, rarely found more than 5 miles offshore. They nest all along the Oregon coast. These are one of the first and last birds you'll see on your pelagic trip, often right near the boat docks. 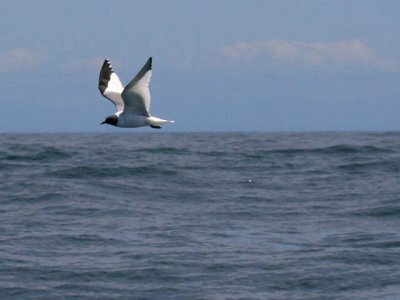 Visit The Bird Guide's pelagic birding web pages to reserve your spot to view Oregon seabirds. Petrels squirting oil. Why? How? And what's oil doing in a bird anyway? Plus more natural history of petrels. What is the world's smallest shearwater? Hint #1: It is smaller than the Audubon's Shearwater. Hint #2: It is littler than the Little Shearwater. Hint #3: It has been found in the United States. Hint #4: It was recently described to science. The world's smallest shearwater is Bryan's Shearwater (Puffinus bryani). If you haven't heard the story of the Bryan's Shearwater, it bears repeating. A small shearwater was discovered and collected in 1963 from a nest burrow in a Bonin Petrel colony on Midway Atoll (a territory of the US, midway between Asia and North America, and 1/3 of the way between Honolulu and Tokyo). It was originally identified as the first record for Little Shearwater in the Hawaiian Islands. Seabirder Peter Pyle recently re-analyzed the specimen trying to determine what subspecies it may be. Instead, he discovered that it was smaller than any Little Shearwater, but colored more like the larger Audubon's Shearwater. Likewise, DNA analysis found that it was closely related to these other shearwater groups, but didn't fit neatly into any one of them. Thus, in 2011 Pyle et al. proposed a new species. That is interesting in itself. And in over 40 years no other Bryan's Shearwaters were found on well-studied Midway, or anywhere else... until 1997. During subsequent years, a total of 6 small shearwaters were captured on various islands in the Ogasawara island chain. Just a few weeks after Pyle published his paper naming the new species from Midway, DNA analysis revealed that these Japanese birds were also Bryan's Shearwaters! Japanese scientists believe there may be several hundred birds on these islands. They remained undiscovered so long because these shearwaters evidently breed in winter when seas are unfavorable for visiting these small islands. What in the world is an Ardenna shearwater? In Steve Howell's new seabird guide, Petrels, Albatrosses, and Storm-Petrels of North America: A Photographic Guide , he notes that seabird taxonomy is in a state of flux. He goes on to call the classification of the American Ornithologitsts' Union "particularly anachronistic." Calling out North America's most influential ornithological society as 'behind the times' is probably only something Howell could do. Since there wasn't any single authoritative "modern" taxonomy to North American seabirds, Howell read all the scientific papers and chose a logical taxonomy. Thus, when you read his book, you'll find new species, genera, and even families of seabirds! Howell's book divides shearwaters into 3 genera instead of the usual 2 to which we have been accustomed. The shearwater genus Calonectris is applied to the Cory's-like shearwaters, those that are brownish with yellow bills: Cory's, Scopoli's, Cape Verde, and Streaked shearwaters. All the world's remaining shearwaters traditionally have been combined into the genus Puffinus. 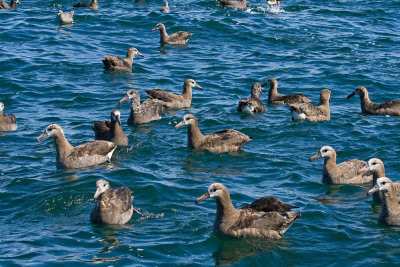 Howell, is the first to create a North American field guide that separates the remaining shearwaters into the smaller black-and-white shearwaters (remaining in the genus Puffinus) from the larger shearwaters in the genus Ardenna, suggested by Penhallurick and Wink in a 2004 article in the Emu and adopted in many Australian bird lists and websites. British and American ornithological societies have yet to adopt this proposal. But now that Howell has introduced this guide you are sure to see more of this new taxonomy.